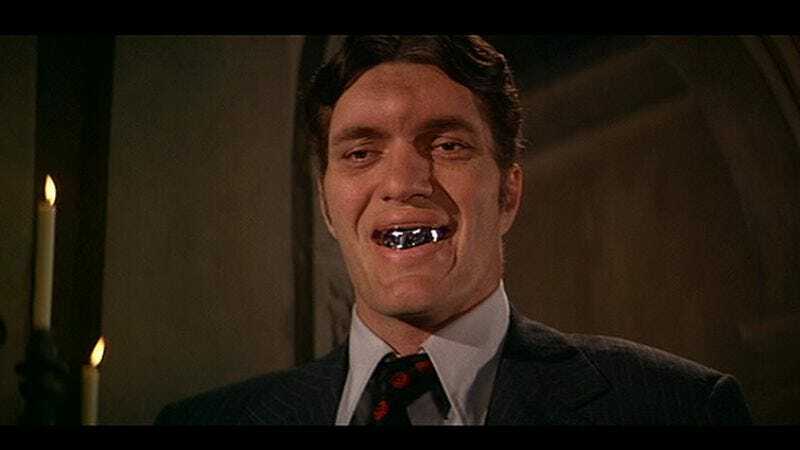 As confirmed by TMZ, actor Richard Kiel has died. He was 74. He reportedly suffered a broken leg last week and had been in a hospital since then, but it’s unknown at this time if that was a contributing factor in his death. His career lasted over 50 years—and despite a memorable appearance in The Twilight Zone’s “To Serve Man” episode—his most iconic role is certainly that of Jaws, the metal-toothed James Bond villain who first tried to kill Roger Moore in 1977’s The Spy Who Loved Me. In a 2009 interview with Den Of Geek (via The Hollywood Reporter), Kiel said that he convinced the film’s producers to make Jaws more likable “to counteract the steel teeth” and make him more human. It worked out so well that he was asked to return two years later for 1979’s Moonraker, a movie that saw his character fall in love and battle James Bond in space. This made him one of the most famous Bond villains in the whole series, and one of only a few to appear in multiple movies. In 1996, Kiel showed off his comedic chops while hilariously threatening Christopher McDonald’s Shooter McGavin in the Adam Sandler movie Happy Gilmore, proving that he could still be funny and terrifying at the same time. He even took a kid-friendly turn in 2010 as Vlad, the ceramic unicorn-collecting barbarian in Disney’s Tangled.